What Is the Biggest Shopping Mall in America? Most U.S. consumers would automatically name the Mall of America when asked to name the "largest" or "biggest" retail shopping mall center in the U.S. This answer was completely correct until the Fall of 2015 when the Largest Mall in the U.S. and the Biggest Mall in the U.S. became one in the same. Before the Fall of 2015, the “largest" mall in the U.S. was the King of Prussia Mall in King of Prussia, Pennsylvania. The reason the King of Prussia Mall was able to lay claim to the "largest" title was because of its square footage. The total leasable square footage of the King of Prussia Mall is 2,793,200 square feet, which was just 13,958 square feet bigger than the second largest U.S. mall, the Mall of America in Bloomington, Minnesota. Before Fall 2015, The Mall of America, on the other hand, could be correctly referred to as the “biggest” shopping mall center in the U.S. because of the number of stores that are located there. The King of Prussia Mall, with more square footage, only has about 400 retail operating inside of it. Comparatively the Mall of America was home to about 522 retail stores as of August 2015, so in that way, it is the biggest. What Happened in the Fall of 2015? In the Fall of 2015, the Mall of America Phase II expansion opened, adding 165,000 square feet of retail space to the mall, which definitively dethroned the King of Prussia Mall from its "largest" record-holding position. With its Phase II expansion, the Mall of America also added more than 50 new retail and restaurant tenants, strengthening its claim on the Biggest U.S. Shopping Mall Center title. The Mall of America is also one of the largest American tourist destinations, attracting 40 million visitors each year, which is twice as many as the Magic Kingdom amusement park at Walt Disney World hosts annually. With the addition of the Phase II retail stores, restaurants, offices, and hotel, it is expected that the annual visits will jump to 60 million, which will make the Mall of America the largest tourist attraction in the world, with more visitors each than Las Vegas, New York's Times Square, the Eiffel Tower, and the Great Wall of China. Unfortunately, the Mall of America will only be able to bask in the glory of its "largest" and "biggest" record-holding status for a few years. If everything goes as planned, the 200-acre American Dream Mall proposed to be built in Miami, will boost Florida retailing with four million square feet, and will be a super-sized version of the Mall of America. Since the same parent company, Triple Five, will own both mega malls, if there is any competition between the largest U.S. shopping mall and the second largest, it should be friendly competition. 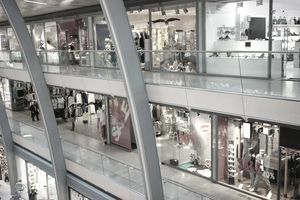 Many of the largest U.S. retail chains like Saks Fifth Avenue, The Gap, Lord & Taylor, and Victoria's Secret are hoping that some retail shopping will get done at the American Dream Mall. In between visits to the Cirque du Soleil theater, water park, theme park, aquarium, movie theater, and concert hall which will all be competing for the attention and discretionary income of American Dream Mall visitors. With its integration of entertainment venues, hotels, offices, and retail space, Triple Five has redefined the U.S. shopping mall experience. While some might argue that a complex with so many non-retail tenants is not classified as a retail shopping center, it doesn't matter. The Mall of America has continued to thrive while retail-only shopping mall traffic is dying and traditional shopping centers are being demolished. Largest Retail Sales Per Square Foot - Apple retail stores have proven that size doesn't matter as much as the customer experience by continuing to lead the U.S. retail industry in terms of sales per square foot. The latest record-breaking number of sales per square foot at Apple retail stores is $4,798.82 per square foot, no matter how big or small any individual retail store is. The World's Biggest One-Day Retail Expansion - Telenor India holds the world record for the "Most Stores Launched Simultaneously" in the Guinness Book of World Records. On August 26, 2015, Telenor India opened 472 new retail stores, which is the largest number of retail store outlets opened by a single retail company in history. With these 472 simultaneous store openings, Telenor India broke its record of 362 store openings in a single day, which it had set in April 2014.